CAPE BRETON, NS – Sometimes it takes a big solution to solve a small problem. A noticeable gap in the Subaru lineup where growing families felt they were outgrowing Crosstrek, Forester and Outback five-passenger people movers. Up until now, the Subaru faithful felt forced to abandon the brand at that point for three-row Highlander, Pathfinder, Pilot, Explorer, Atlas, or other choices. 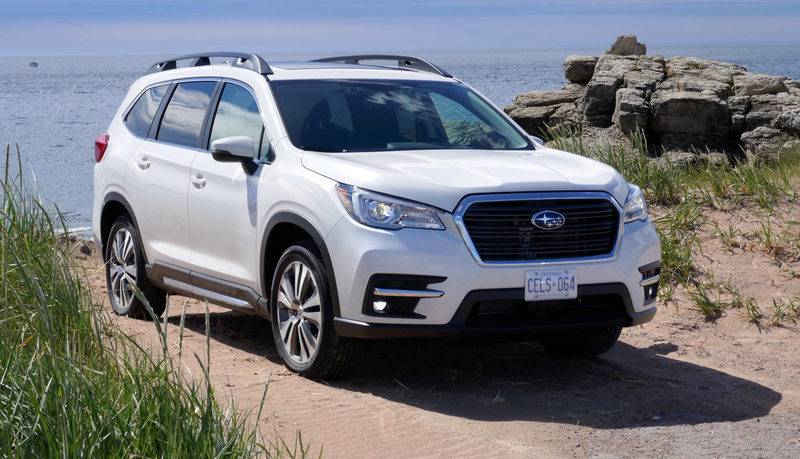 But, starting this July, a new 2019 Ascent, the biggest Subaru ever, fills that gap with trademark technologies and roomy three-row passenger-carrying abilities in seven- or eight-passenger configuration models. Yes, Subaru gave this a shot in an earlier era with the oddball and ill-fated B9 Tribeca. But the new Ascent that’s bigger, better planned, better proportioned and packed with modern techs and features, should make a larger splash in the burgeoning mid-size SUV segment. If you’re coming late to the party, you might as well make a grand entrance. And the Ascent does just that, building on Subaru’s latest global platform with company core values such as the brand standard Subaru symmetrical full-time all-wheel-drive with low-speed X-Mode and Hill Descent Control, the horizontally-opposed boxer engine layout with its intrinsic low centre of gravity handling traits, and with a long list of other safety and performance technologies included in this new SUV flagship. Subaru also added the EyeSight monitoring system as standard equipment. This normally optional preventative safety suite reduced pedestrian-related insurance claims by 35 per cent in previous applications and, along with pre-collision braking and brake assist, includes throttle management, adaptive cruise control, lane sway warning and lane-keep assist, along with lead vehicle start alert. And the long list of other standard and available features includes a number of firsts for Subaru including a new smart rearview camera, new front-view camera, new standard three-zone climate control, rain-sensing wipers, bigger 20-inch wheels, ambient interior lighting, built-in rear door sunshades, third row USB ports, a new panoramic sunroof, a driver’s seat extension and ventilated seats. The Ascent comes in four trims – Convenience ($35,995), Touring ($40,995), Limited ($46,495) and Premier ($49,995). Base versions start with an eight-passenger configuration but customers can opt for a seven-passenger layout with second row captain’s chairs available in Touring and Limited trims ($500), or standard in the top-of-the-line Premier model. The Ascent pushes all the right Subaru styling buttons with a familial design stroked with upscale design cues, a more upright grille, jewel-like headlight assemblies and muscular accent lines. Under the skin, the Ascent harnesses a new 2.4-litre direct-injection turbocharged four-cylinder Boxer engine, a larger but lighter evolution of the WRX’s 2.0-litre FA motor. Power is rated at 260 hp along with a peak torque rating of 277 lb/ft delivered evenly across a 2,000 to 4,800 rev range. With a 0-100 km/h acceleration time of 7.4 seconds, the engine makes its muscle honestly on regular gas and streams its oomph through a high-torque Lineartronic CVT transmission that can be stepped through an eight-speed manual mode with paddle shifters before putting power to the pavement through the all-wheel-drive. Subaru hosted the Canadian launch of the 2019 Ascent in Nova Scotia and I was eager to see if this four-banger really did make the kind of power formerly reserved for engines six-cylinder-sized or bigger. The 2.4-litre pulled unerringly along the slopes and curves of Cape Breton, inspiring mid-range confidence in passing maneuvers, handling asphalt and gravel with aplomb, even towing big boy toys, boosting its normal 908 kg (2,000) tow rating to 2,270 kg (5,000 lb) with the added oil cooler and tow preps included in all trims above the base Convenience level. Driving confidence gets a big assist from a rigid platform that boasts taut yet civilized ride and handling traits. The Ascent may be bigger but it doesn’t feel ponderous, quietly going about its business with graceful road manners, even feeling nimbly toss-able when pressed. Some vehicles would reveal their flaws over the course of a 300 km Cabot Trail test drive but the Ascent’s charms just seemed to increase with familiarity. 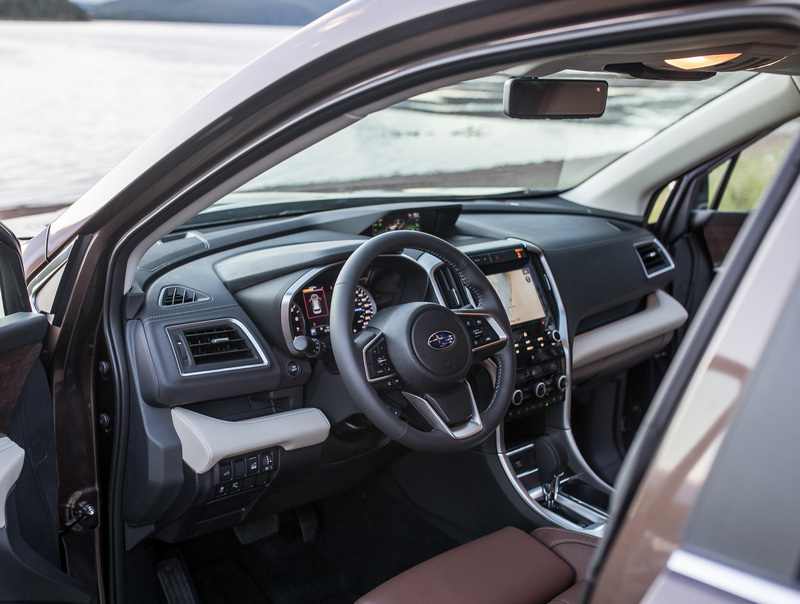 It helps that there’s comfortable cabin space inside, with the requisite higher vantage point, and with Subaru’s slender pillars and new panoramic sunroof adding to the airy open feel of the greenhouse. It’s roomy up front, as expected, but I could even “sit behind myself” with the driver’s seat racked back. 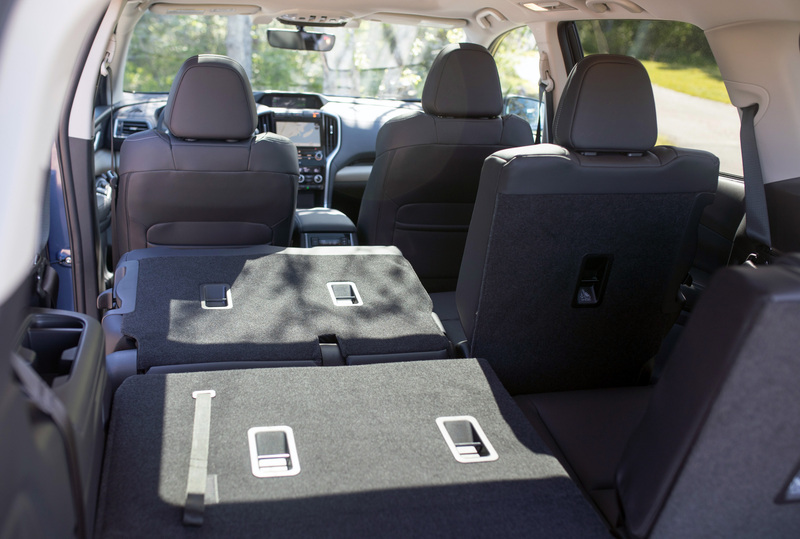 The Ascent’s rear doors open 75 degrees wide for easy second row access, and even third row accommodation is do-able. Fold that third row flat and the big-for-its class 504 litre cargo area expands to 1,345 litres, maximizing to 2,449 litres behind the first row, complete with an underfloor storage area that can neatly hold the tonneau cover. Other notable features include a long list of mod cons, neat storage innovations, up to six USB outlets and, ready, 19 cupholders. I could go on and on but check the equipment list online, especially the dollar-for-value inclusive features that are usually expensive options with other brands. You’ll see why this new, biggest-ever 2019 Subaru Ascent is bound to lift the lineup to new heights. DRIVE METHOD: Lineartronic CVT with Symmetrical AWD.